I can’t recall the last time I voluntarily weighed myself. It was probably at a doctor’s office visit last year or thereabouts, and you can see how memorable it was for me. It helped that the nurse read off my weight in kilograms because I could pretend I had no idea what that translated to in pounds. Sometimes it’s a good thing not to know. Believe me. But I do remember that the doctor said I was carrying around an extra 15 pounds above my ideal weight (whatever that means). She mentioned cardio, and whatnot, but at the time I wasn’t really up for listening to her. I wasn’t really up for listening to her because I suffer from That’s-the-way-it-used-to-be syndrome, a common ailment of no-longer-young men everywhere. When I was a teenager it didn’t really matter what I ate. My weight was going to stay exactly the same. In fact, I could lose weight just by thinking about it back then. And that carried over into my early 20s, but by the time I got to be around 26 or 27 the gods of metabolism began taking away what they had given me. To this day I still curse their names. It was around 26 or 27 that my metabolism began to slow, but I didn’t take much notice at first. At first it was easy to put down the small weight gain as a “fluctuation,” an outlier that would soon correct itself and everything would be back on course. I kept eating my weight in food, sure that things would return to “normal” sooner rather than later. Before I knew it my clothes became difficult to zip up, to button down, and to slither into. I was in disbelief, thinking it was the clothes that had somehow shrunk, that it had nothing to do with my own expanding physique. Eventually, though, I couldn’t fool myself anymore. So I set a regimen for myself. But like most guys who stretched out in puberty and didn’t have to worry about trying to lose weight for a good 10 years, I had absolutely no idea what to do to accomplish my goal of dropping 10 pounds (4.53 kilograms) over the course of my 28th summer. In lieu of actual knowledge about it, I went to the tried and true: smaller portion size, and exercise. I cut my meal portions in half (even though I felt like I was starving), and I started walking around the neighborhood daily. That lasted for approximately four weeks. By that time, of course, I was starting to see results, so I thought I was good to go. And by “go” I mean everything going back to my normal no exercise, large portion size self. And of course within a couple of weeks I was not only back to my 10 pounds over my ideal weight, but I was an extra 5 pounds in the opposite direction. Uh oh. That was 10 years ago, and in the intervening time I have been off and on when it comes to adjusting my diet and getting physically fit. For a while I went to spinning class. For a time I walked religiously on the treadmill. I even cut out daily snacks for a small amount of time. Yet my weight still fluctuates, going from close to the ideal to between 10-15 pounds over. I can feel it in the way it redistributes itself when I spend too much energy on any one activity. Like when I walk down the street for more than one block. Something isn’t right about that. That’s why now, 10 years after my initial experiment in weight loss and positive fitness, I’m getting down and dirty with it again. This time it’s for real (I feel like I’m doing a trailer for Expendables 4 or something). So I got myself a FitBit. You know, it’s one of those things that tracks the number of steps you take every day. You set goals for yourself and it tallies up the numbers while you walk and exercise daily. I’m one of those people who believe in the concrete. I like to watch the numbers climb higher while I’m walking. It makes me feel like I’m doing something worthwhile instead of “just walking.” The FitBit app tells me I should try for 10,000 steps a day, so I’m actually going for 10,000 steps a day. It’s like a competition against myself, and those were always the best kind. We’ll see how long it keeps my interest. I’m hoping for a long time. You know, because I’ve still got that pesky 10 pounds or so over my ideal weight that I must shed before the next bathing suit season. Good luck! I love my Fitbit! I’ve only had it a few months but it has proven to be good motivation. I love getting everything green on it, hitting all the goals I set up for myself. Which Fitbit do you have? I have the One, someday hope to get the one with a heart rate monitor though. 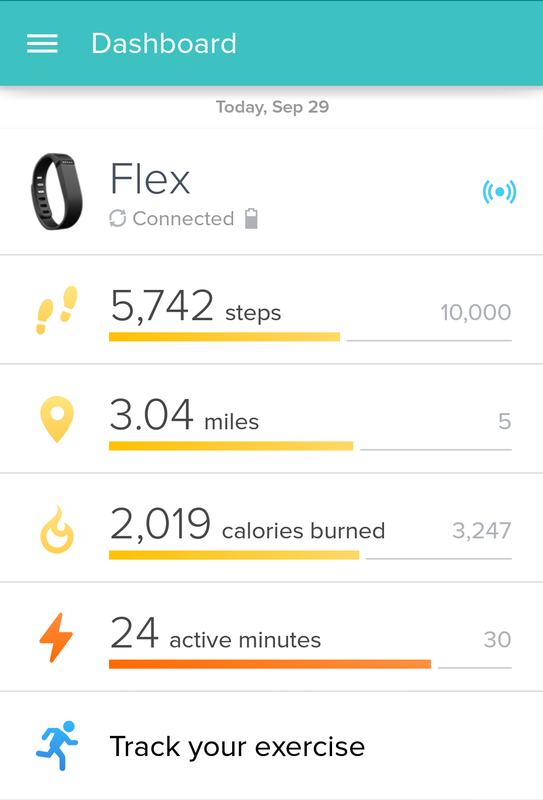 I have the FitBit flex and it seems to be simple to program and watch those goals pass by. I think I’m already addicted to it. Earlier tonight I was going up and down the stairs just to get in some Extra steps. Thanks for the encouragement. It is much-loved appreciated. We should be FitBit buddies. Here’s a link to my profile if you want to add me from there. One can never have too many Fitbit friends. Thanks for the info! Let’s challenge each other! I love my Fitbit! Actually, I’m on my second after my first broke down. I’ve been wearing one for 2.5 years now. 😀 It definitely makes it more appealing to park further away and just get extra steps wherever I can.